Shamcey Supsup miss universe online poll number 1 one, shamcey supsup latest news images pictures photos on brazil miss universe 2011 images pictures of shamcey supsup. Shamcey Supsup as the winner of the global fan vote will be revealed during the coronation night of Miss Universe 2011 on September 12. Online poster courtesy of Bb. Pilipinas. 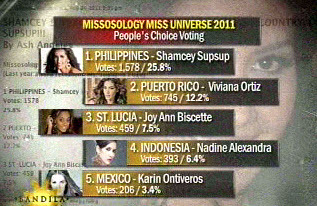 On a report by Bandila on Friday, Miss Philippines Shamcey Supsup is on the lead in the online poll of Miss Universe 2011. This is for first time in the history of the MISS UNIVERSE® competition, the pageant is incorporating a global fan vote that will fast-track one contestant to the semifinals. That’s why the Miss Universe online poll is on track of excitement this year because it’s a great semi-final placement. Bandila reported that according to the Bb. Pilipinas Charities, our beloved Shamcey Supsup is currently at no. 1 of the official Miss Universe poll followed by the delegates from Puerto Rico, St. Lucia, Indonesia and Mexico. 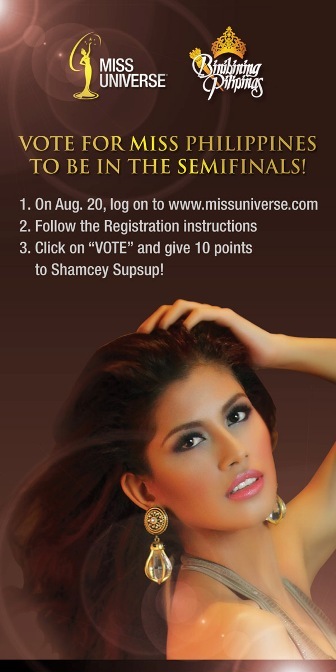 We are hoping that Shamcey Supsup will bring home the Bacon for our beloved country philippines!